This Sweet Ninja Teriyaki is said to be a "sweet flavor that hails from faraway shores". 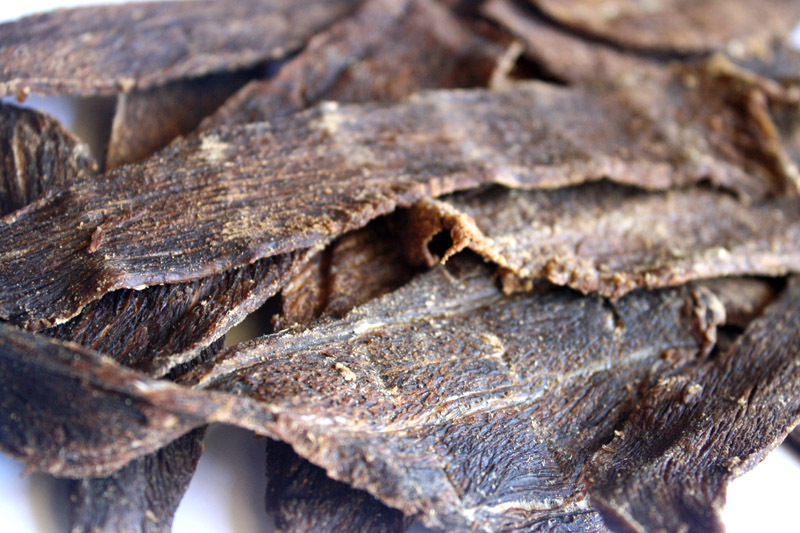 The company claims, "fresh ginger is the star ingredient along with brown sugar and soy in this sweet and tangy jerky which will have the whole family clamoring for more." Beef, soy sauce, fresh ginger, spices. The first flavors to hit the palate is a light sweetness, with a noticeable ginger coming in later. The chewing brings on a lighter level of soy sauce than with the company's Bull City Original and Famously Hot. For being labeled, "Sweet Ninja Teriyaki", it has something of a teriyaki flavor, but not quite the Japanese-style teriyaki that I've come to know as a Japanese-American. I can't really pick up the fermented character that usually comes with either sake or mirin wine. I do, however, get a tangy chewing, probably from the lime. 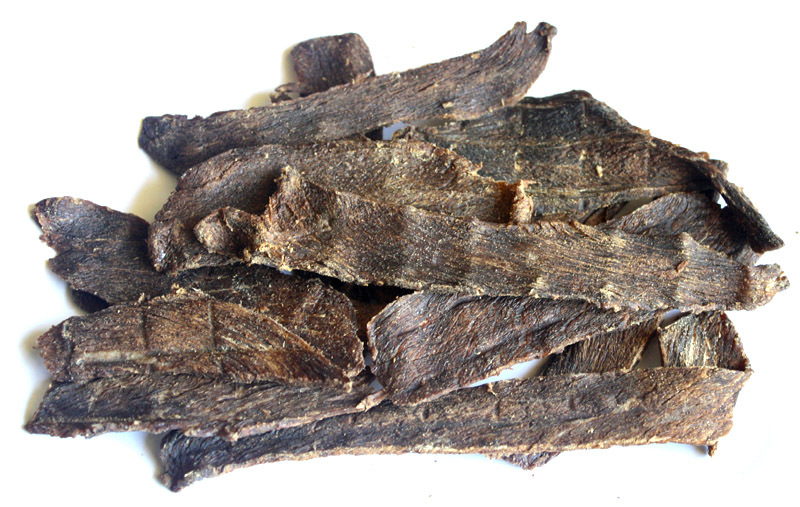 But this jerky does have the "sweet" part, though not the heavy sweet that's often associated with most teriyaki. 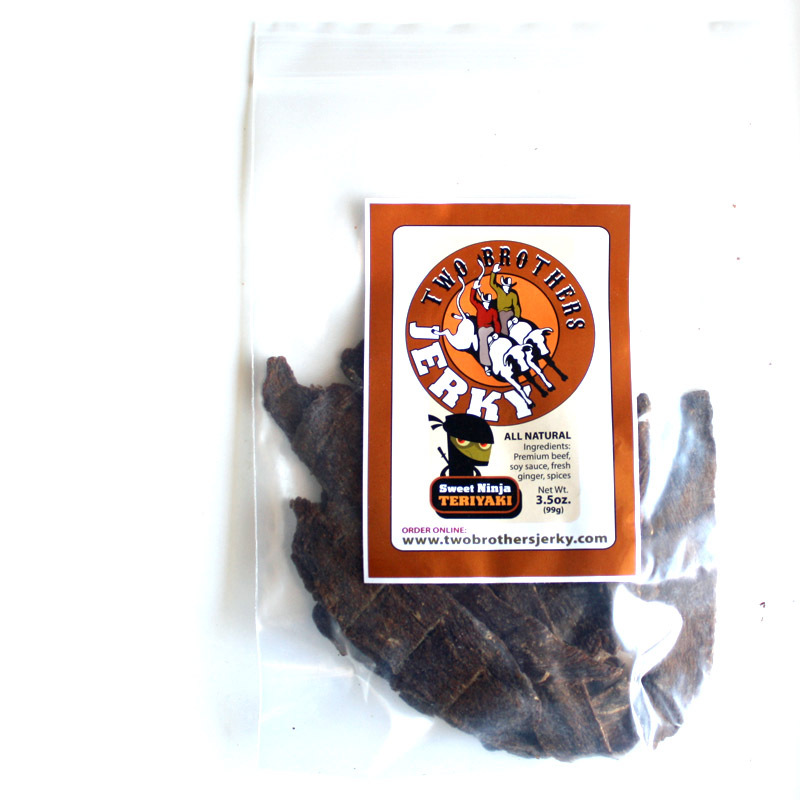 This jerky is much more mild in terms of spiciness, and it tastes a lot less salty. The natural meat flavors are not well noticed, largely due to the heavier soy sauce and smokiness. The meat consistency seems excellent. Mostly all meat with only small streaks of fat noticeable. I found no stringiness or unchewable tissues. It's quite soft actually, even though it's rather dry to the touch. It doesn't feel rubbery or gummy at all, it's more dry and woody, but soft and flexible. Overall, chewing varies from easy to moderate, and feels like pieces of real steak. Verdict: This Sweet Ninja Teriyaki beef jerky from Two Brothers Jerky has a different take on teriyaki compared to traditional Japanese-style teriyaki. It's not quite as sweet, and instead of the fermented character from sake or mirin wine, it generates a tanginess from lime. It still seems to work, but I keep wanting to taste the sake/mirin wine instead. Just as with the company's other varities, the meat consistency is a big winner, being easy to eat, chewing like real steak, and offering nothing but meat.